Cliff Mass Weather and Climate Blog: The Rewetting of the Western U.S. Wait for governor brown to announce the cause of the rain is climate and something (taxes) must be done! "gnitteweR of the Western U.S."
Sounds like an oximoran ! Any idea on how long it will take those jokers in California to fix the Oroville dam? Essentially the current post is about California and Washington hydrology but no Oregon. Please consider including reservoir and stream flow data for us in the future. 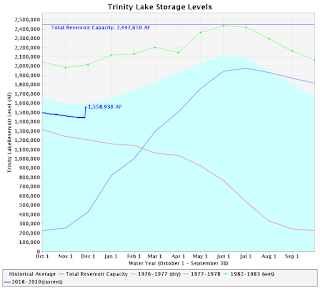 The NRCS has not updated Oregon November reservoir data yet. The USGS map data for Oregon streams shows mainly 25-75% normal, with about 14 sites below 10% and around 23 sites between 10 and 24% normal. Absent any other data and despite the recent uptick in precipitation, this looks like in this state we are still well short of favorable hydrology. I am still optimistic about wetter conditions to come. But I wish you could expand the scope beyond your corner of the Northwest. I think that's controlled by the Army Corps of Engineers? As soon as they complete the non - bullitt train to nowhere, they'll get right on it! The SPU graphs are as of 11/26 (expect significant inflows when that is updated), and the engineers have been dumping water for weeks. I think you are burying the lede here, which is the precip this fall in our WA Olympics and Cascades. Which in and of itself is not a huge story, it is not like we have seen major flooding or that this year has differed all that much from recent wet years in the mountains. But it is when all we have been hearing - since NOAA announced that our fall here would be (very) dry (again), is how dry it has been. And it hasn't - particularly where it matters most (our watersheds) - not by a long shot. Not that we're in "wet-drought" territory yet - like the infamous 2015 season, where we broke records for fake drought insanity - but we're getting there. It's just frustrating to listen to the deception and fear-mongering. It happens every year now, and unfortunately people believe it. It seems you spoke too soon. They are now considered France's worst riots since 1968. Placeholder, I tried to answer your constructive criticism in the comment section of cliffs last blog. If you need more information I'd highly suggest you read Bruce Tempers book "staying alive in Avalanche Terrain". He also has a new one out. I believe he works at the Avalanche Center in Utah. Out of all the Avalanche safety books out there, Bruce thinks more like the way back country skiers think. Regional forecast are no good if you don't know how to evaluate the particular slope your considering skiing. Personally I never have looked at the regional forecast unless I'm trying to do research on a past Avalanche incident. Unfortunately lot of people rely on original forecast to make their decision for them. There really aren't any shortcuts. It really helps to listen to your uncertainty and to gather the knowledge and stay conservative as you gather experience. But most people just poach other people's skin track and place those groups at in increased risk of harm. Lots of good Avalanche centers out there, unfortunately the one we have in Washington State is not one of them. But I'm hopeful they will improve, because right now, putting out inaccurate information when it comes to safety is downright irresponsible. Placeholder, if I can try to address any more of your concerns don't hesitate to ask. And this comment I used the word 'poach'. That's skier slang for someone who takes advantage of all your, or your groups, hard work hard work of breaking a trail and follows you up only to become a hazard to your group on days when there's an avalanche concern. Usually those "poachers" are sipping lattes while the trail Breakers are out there evaluating snow conditions and busting their butts breaking deep snow. The commercial guides poach a lot of Trails in our area. Apparently does young guys are too tired from heli-skiing to do the work themselves and they like to keep rested up for their next day on the hell-bird. In our area we refer to those guys as carpetbaggers. And just so you're not confused, lots of the old-time skiers show our routes to newcomers to our sport or new to our area. We're proud of our mentorship initiatives in the tradition of those who mentored us in safe travel in the mountains. In reading many of your posts regarding drought, Cliff, it appears that you are mainly referring to meteorological drought- the amount of precipitation over a time period. However- doesn't the temporal pattern and timing of rainfall affect hydrologic drought more substantially than just the sheer amount of water that has fallen? For instance- a heavy rainfall over a short period of time on dry soil produces mostly overland water flow- a quick dump of rainfall into streams and some soil erosion but not a lot of water infiltration into the soil, versus small amounts of rain steadily will infiltrate the ground more effectively. Groundwater recharge rates, soil moisture, aquifer recharge- these are affected on different time scales than simply how much water has fallen in one season, and take longer to respond. 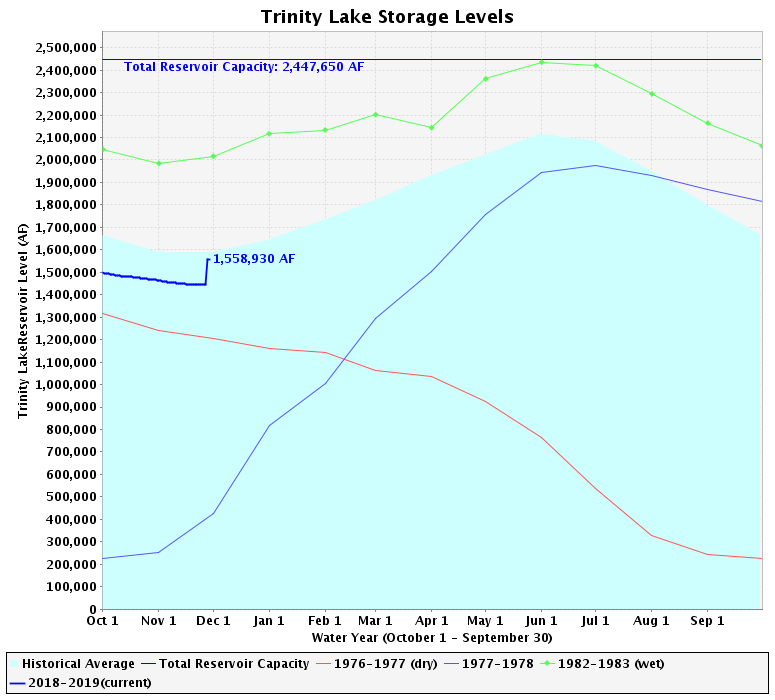 So yes, filling the reservoirs is nice, but when talking about drought, there is more to the story, yes? Governor Brown, as they call him, isn't a Astrophysicist, or any sort of expert on any level. On another note, anyone ever look at weather.com for their weather? Talk about a political agenda. They show a dark red color (warmer than average) up here all December! HaHa. Look at what our temps will be for the first 2 weeks of the month! I swear, 2+2 = 5, warming now causes cold weather and so on and so forth. Let's see who's right and who's wrong. Let's let the Sun shows us who is in control of climate shall we? CO2 doesn't drive temperature folks. This winter and the following will get some attention finally to the nitwits who believe this nonsensical politically driven rubbish! TWC is owned and operated by the consortium of Comcast/NBC/MSNBC, which tells you all you all you need to know about their inherent biases and agenda. When they were owned by Landmark communications they stuck to the weather forecasts, and that was it. Now it's nonstop 24/7 scaremongering, replete with scary images of impending doom, even when they're only discussing a local storm. They are hacks, period. Bearing on your comment, on page 12 of the weekly USDA climate report (https://www.wcc.nrcs.usda.gov/ftpref/support/drought/dmrpt-20181129.pdf) is a map of soil moisture indicators. Except for three small spots (one in SW and two others in central Washington locations), the modeled soil moisture there is generally below 30%. A bit of E Wa. is in the 30-70% range. Not surprisingly Oregon is showing a swath in the red or less than 5% range and more in the less than 20% designation. I have been trying to run down Oregon data corresponding to that Dr. Mass put up in this post for Wa and Ca. I prefer tabulated data and NRCS I hope will soon be putting up the most current charts of reservoir data. The color graphics are kinda hard to read but its clear to me on the map views that I have found: reservoirs and stream flows are low here in OR. Snow pack is definitely in deficit. By simple mass balance accounting for water in mountains, reservoirs, soil and streams no other explanation such as water managers decisions on water release, etc. can explain away the drought designation the USDA has given Oregon. Again I remain hopeful about the coming winter. The Stormsurf fellow should soon be putting up his prognostications regarding MJO and ENSO. I think it's important to remember that its not really about warming or cooling.. the fact remains that burning barrels of oil in an enclosed system will lead to unhealthy air quality.. similarly extracting oil the way this industry allows (gulf of Mexico) is absolutely shameful. Should be criminal. Even if Mars had 1/100th of Earth's fresh water that would be considered a miracle! How did our planet get all of it? When we moved out of Seattle, People's Republic Of, to the countryside where there's no cable, I got a satellite dishes, one from Hughesnet for middling Internet and another from Dish for TV. Dish carries the Weather Channel and Weather Nation. If you want what TWC used to be, you watch WN. When it comes to weather, >90% of my watching is of WN; I only switch to TWC during commercials. TWC really stinks. The propaganda crowds out the actual weather. But two weeks of good rainfall doesn't mean there's now no possibility of drought, does it? The next several days, for example, look bone dry. Couldn't we be right back to a below-normal pattern? Cliff - As if it isn't obvious, this following video could be useful to all, left and right. For you too, in regard to his comments regarding experts and their approach to wicked problems, which despite their own perceptions are seldom strictly rational.